SMARTY Trend head device oxerview for Lexus GS 300. 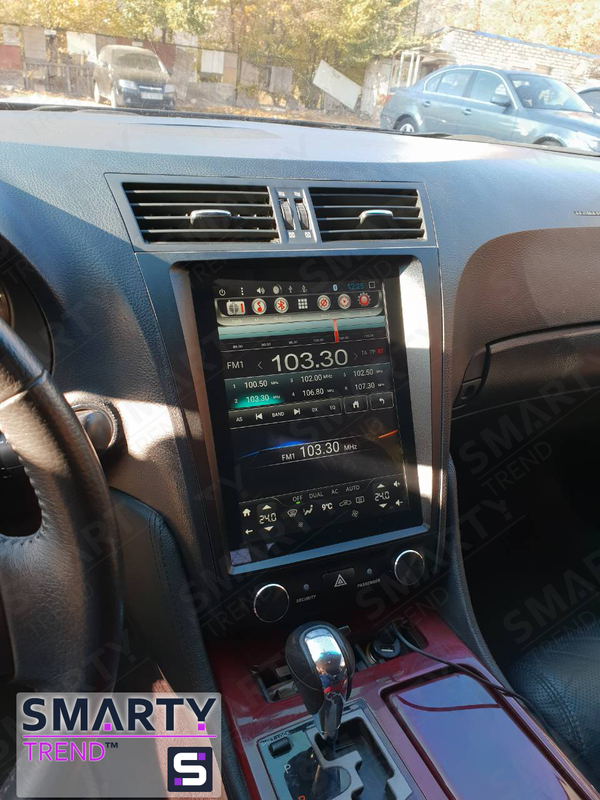 We present to your attention an example of installing a standard SMARTY Trend head unit in Tesla style for a Lexus GS 300. This car is very polar so it makes no sense to talk about its advantages. But there are significant shortcomings in the configuration. Very often, the cost of a complete set is unjustifiably high, and its quality leaves much to be desired. Until recently, to perform the improvement of functions was quite a big problem. Company SMARTY Trend always happy to help you not only with the choice of the device, but also with all your qustions. Devices in the style of Tesla are particularly popular among motorists, but many think about the presence of certain problems when installing this device. These devices are standard, that is, they are specially designed for a particular version of the car. There is no installation problem even with the 12.1 inches Full-touch screen. Device management, as well as all the regular functions of your car is on the main device. Head units in Tesla style not only expand the functionality, but also fully support all regular functions. All that is needed to install this device comes with a warranty on the device. One of the main advantages of Tesla style devices is the screen. It is very convenient to work with this device if you take into account the diagonal, which is 12.1 inches. HD resolution, excellent viewing angles, the 1.6 GHz Quad-core (Allwinner T3) processor can ensure fast operation of the device. Thus, working with navigation, browsing media files or searching the Internet has become even more convenient and comfortable! Today's world hard to live without internet. Head unit SMARTY Trend is no exception. You have several options that relate to internet connection. You can use your mobile phone as a point of access to the Internet before it synchronizes with the head unit. But if you are interested in the creation of a full-fledged access point to the Internet for absolutely any kind of WI-FI model. The company SMARTY Trend recommends installing an additional 3G / 4G router. For many, the question of sound is crucial. We are pleased to inform you that the devices in the style of Tesla not only support all the regular functions, but at the same time, we paid special attention to the sound quality. Hi-fi sound processor provides excellent quality of sound. On the Google play market you can find a large number of equalizers that will help you adjust the sound the way you like it. Let's summarize with you. In this car, the Lexus GS 300 significantly added functionality, and the Andoid operating system provides great opportunities for individual settings. The car looks more modern; the build quality is not inferior to the quality of the maximum configuration. Even surpasses it. The SMARTY Trend head unit in Tesla style is the perfect price-performance ratio for your car!